Michael Frazier attended Wooster College from 1999-2003. During his time there he interned at Wachovia Securities and Smith Barney. Immediately upon graduation the Philadelphia Eagles hired him a “Statistical Analytics Coordinator,” a post he has held for the last seven years — in complete obscurity. 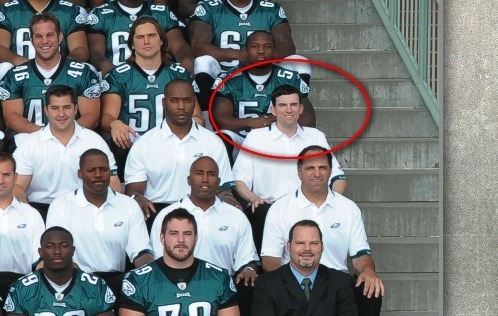 Frazier’s colleague Alec Halaby, the Eagles’ “Player Personnel Analyst,” isn’t even in the most recent team photograph. He’s not a scout, but got a small promotion to this position according to Adam Caplan, who called him a “statistical analyst, young guy, been with the team for awhile.” How long that has been is unclear though, since he seems to be the same Alec Halaby who was at Harvard as recently as 2008. We don’t know much more about Frazier and Halaby’s presumed boss, Jeff Dominitz (pictured at left). Dominitz is the Eagles’ “Director of Statistics,” and from what I can gather, is (or recently was) also an Adjunct Staff member at the Rand Corporation, a nonprofit research organization. Before coming to the Eagles, he received a Ph.D. in economics from the University of Wisconsin, worked as Associate Professor of Economics and Public Policy at Carnegie Mellon University and served as research director of the Census Research Data Center. All of the above could be viewed as rather stalker-esque, but it’s really just in pursuit of a very simple goal: getting some insight on the statistical analysis the Eagles do. Obviously this blog, along with a handful of others, are always looking for new and better ways to analyze pretty much anything about our favorite team. These guys do the same thing from the inside (with MUCH more distinguished backgrounds and methods), toiling anonymously in the background of all the decisions made by the Eagles over the years. • Led implementation and validation of large database and integrated information from multiple sources. • Addressed a wide variety of questions related to injury risks, game strategy, and player performance posed by the Head Coach and Team President. • Identified characteristics of teams and players that have been successful in the NFL. • Created models to predict how well college athletes will perform at the professional level. The team uses statistics for basically everything: injury risk (maybe that model isn’t working too well right now), strategy (too bad they haven’t helped Andy with clock management), player production, and probably much more. Reid and Joe Banner ask specific questions of the stats team to analyze. These guys are embracing and using any advantage they can get. There’s a reason Jeff Lurie could easily slip a YPA mention into a discussion about Lito Sheppard — the front office is very familiar with all of this. The Eagles have some sort of huge database of what I guess are players, careers trajectories, salaries, draft picks, at more that they use to their advantage. They have models, based on past precedence, that indicate who is likely to do well, even coming out of college. I imagine this is somewhat akin to models like “SackSEER” Nate Forster at Football Outsiders did for defensive ends. To determine whether a player will do well for your team, Statistically Speaking Consulting can identify the right metrics to use and how to combine them for an accurate prediction of a player’s future success. This is critical when players are transitioning from high school to college or from college to the pros, since the existing data is relative to a lower level of competition. It also helps to more accurately judge the benefit of a player, so that you do not overlook those who are undervalued by traditional methods and do not overpay for those that are overvalued. In addition to finding the right metrics for individual players, we can help find the right metrics to identify the real areas where your team needs to improve. This can be used to change strategies for coaching decisions, or for front office personnel to find players that will have an impact in the needed areas. In combination with your current process, these statistical results can improve your decisions so that you take better advantage of your limited resources, like scholarships, draft picks, and money. Sounds like things Lewin probably did with the Eagles: finding metrics to judge performance more accurately, analyze areas of strategic advantage, and apply these models to help the team pursue the most cost-effective free agents, draft the correct players, and call the optimal plays. The ability to predict player performance close to the way PECOTA does for a more individual sport like baseball would be the holy grail of football statistical analysis, and I doubt the Eagles have arrived at a secret formula for that. But every little bit of predictive power (or even just accurate data accumulation) is helpful, and I imagine, despite their reclusive nature, that the Eagles’ stats guys are hard at work providing that for Andy Reid and company. Tagged with Philadelphia Eagles, Statistics, Stat Team, Front Office, Coaches, Analytics, Michael Frazier, Alex Halaby, Marty Mornhinweg, Andy Reid, Jeff Dominitz, Dan Lewin, Joe Banner, Staff, Interview, Information, Database, Injury Risk, Strategy, Performance, Prediction, Analysis, Anonymous, Jeff Lurie. June 14, 2010 by Brian Solomon.